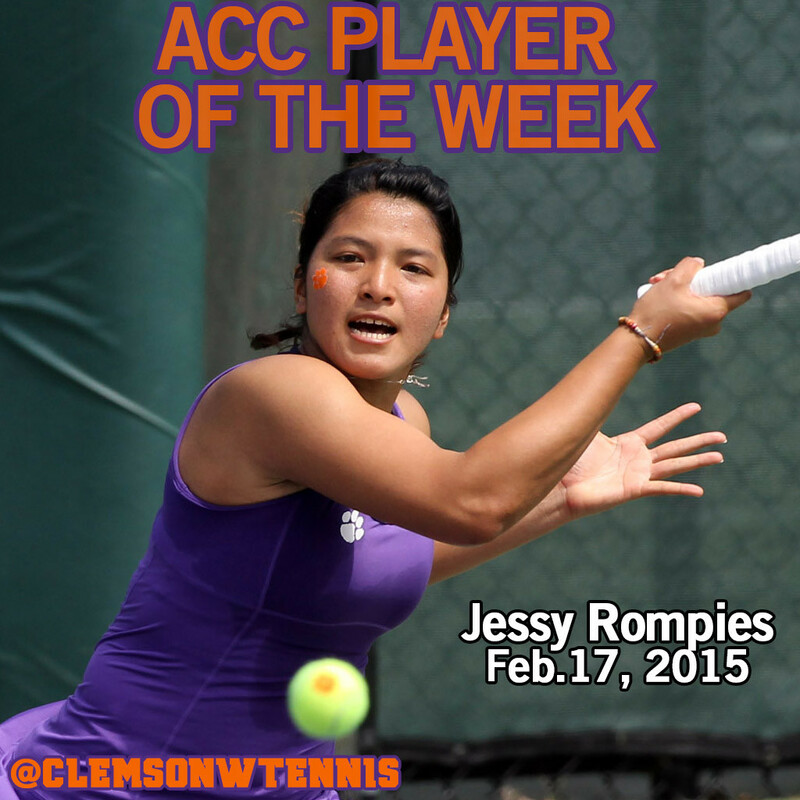 CLEMSON, S.C. – Clemson women’s tennis player Jessy Rompies has been named ACC Player of the Week as announced by the conference on Tuesday. It is the second player of the week recognition of the young spring season for Rompies as she also received the honor Jan. 27th. The senior won both her singles and doubles match against No. 6 Baylor on Sunday as the Tigers fell just short, falling 4-3 to the undefeated Bears in Waco, Texas. Rompies, ranked No. 75, defeated Baylor’s Rachael James-Baker, ranked 86th by a score of 7-5, 6-1. The native of Jakarta, Indonesia was playing at No. 5 singles for the Tigers. With the win, Rompies moves to 13-3 on the season and 6-1 in dual matches this spring. In doubles, Rompies and her partner Beatrice Gumulya, ranked first nationally, continued their winning ways with a win at number one singles. The duo defeated Burgic and Shankle, ranked 27th by a score of 6-3 and clinched the double point for the Tigers. The pair is 18-1 on the season and 6-0 in dual matches this spring. Clemson returns to the courts Friday, Feb. 20 at home against No. 50 Virginia Tech. The match between the Tigers and Hokies is scheduled for 2:30 p.m.